You can do recording of your inbound or outbound or both inbound and outbound calls on DoorVaani.com servers. A very small call recording charge will be applicable on a per recorded minute basis and your call recordings will be stored on the DoorVaani.com servers and will be available for download for up to 30 days from the day of the call. 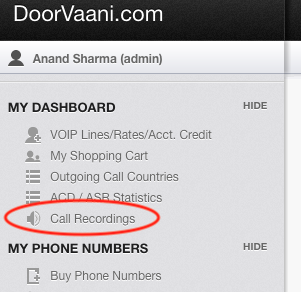 You can also listen to your call recordings directly from your DoorVaani.com account. How to enable Call Recording on your VOIP Line? Go to “VOIP Line Details” page, by clicking on your VOIP Line username in the “My VOIP Lines” page. If you are not on the “My VOIP Lines” page, you can come to this page by clicking on “MY DASHBOARD > VOIP Lines / Rates / Acct. Credit” menu from the left hand side. Locate the “Call Recording Options” section on the “VOIP Line Details page”. You will see the following four call recording options. Please select the one that best suits your needs. While you are on a call you can either “Stop” or “Start” call recording. For this option to work, you must have set “Incall Stop Restart Recording” option to “Yes”. Please see the above image. You can also do “On Demand Call Recording” as well for those calls on VOIP Line(s) which are not enabled for call recording. Here are the key combinations that are to be used for these options. How to access your call recordings? To access your call recordings please click on “Call Recordings” menu under MY DASHBOARD as shown in the above picture. You can filter your call recordings by using the filters available in the top section of the “Call Recordings” page. You can listen to your call recordings online and also download the recorded files to your local computer. Please note that the number of times you can listen to your call recording online from our server and the number of times you can download is limited. You must ensure that you download your call recording within 30 days of the day of the recording. After 30 days the call recordings will be permanently deleted from our servers and cannot be provided to you anymore beyond this 30 days period.